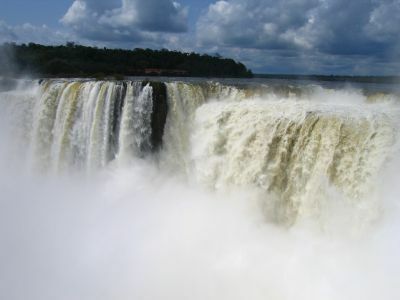 two galleries dedicated to the most amazing natural wonder i have ever seen, iguazu falls in argentina. 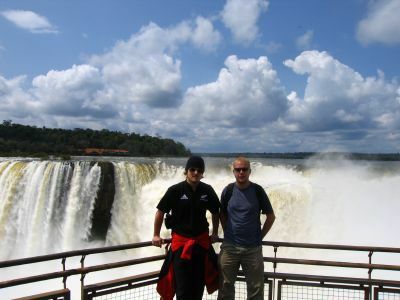 this was my first look at garganta del diablo, the throat of the devil, a horseshoe of waterfalls. 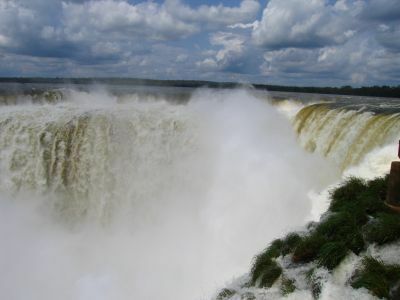 the sheer volume of water that continually plummets over the edge is almost impossible to believe. 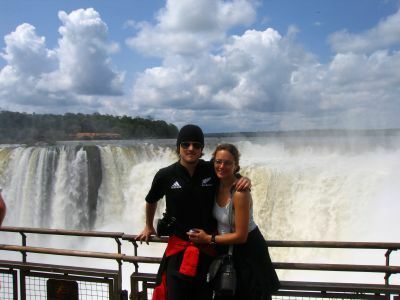 i toured the falls with some friends from the hostel. 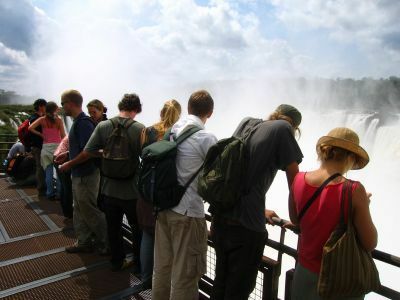 here are most of them peering over the edge at the mesmerizing falls. 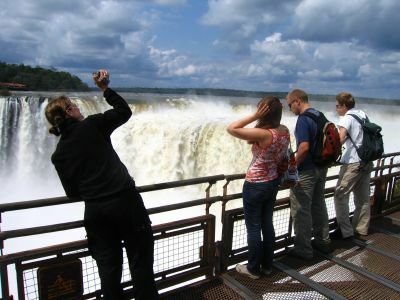 alexis, from the u.s., my traveling companion for a couple weeks, videoed the falls and our reactions to the spectacle. 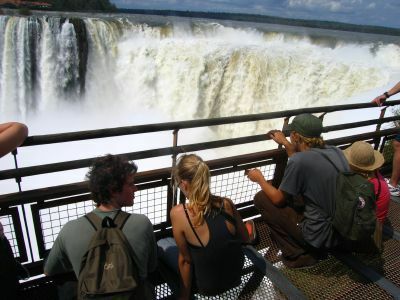 hannah, will, and aidan, all from england, stare over the edge. after you stare for a while it's time to get pictures of yourself to prove you were there. here will and i pose for a shot. and then alexis and i.
i am half-finnish so i always like to run into finns, although i can't speak to them in finnish. 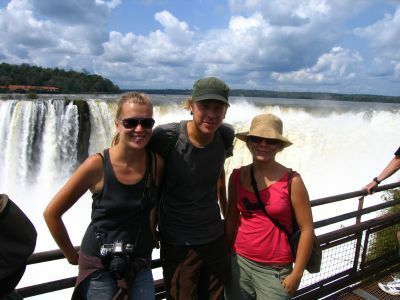 three folks in our group were finns so i took this shot of them in front of the devil's throat. sometimes you just had to sit down to take it all in. will walks away before i take his picture but the shot is still cool. walkways twisted throughout the park, between, above, and below waterfalls to provide many different perspectives on them. 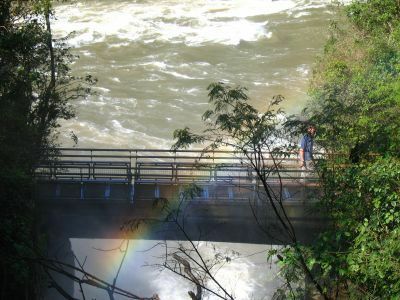 this bridge hung right at the bottom of a waterfall. 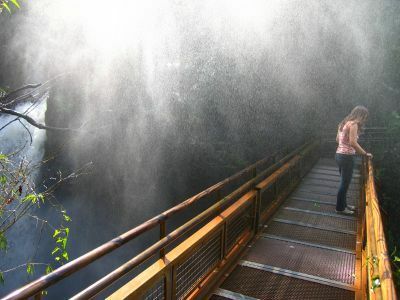 i like this shot of hannah on the bridge, all the mist of the waterfall hanging thickly in the air around her.